One of my favourite parts of Christmas is the lights. 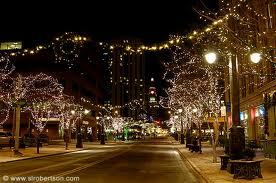 It seems that Christmas lights up the world. Yesterday was December 21st the winter solstice, this is the longest night of the year and the shortest time of daylight in the year. So it's interesting to me that when we're in the darkest part of the year, Christmas pierces the darkness with light. Lights were important in the first Christmas. The angels did the dazzling light show in the sky, the wise men saw another bright light in the sky - a star- and they followed it to where Jesus was born. I want us to look for a few more minutes on the light of Christmas for your dark days. Looking back at 2011 it got me thinking about specifically 3 types of dark days; Dark days of disappointment, distress, and doubt. Maybe you can relate to at least one of those. There's been a lot of disappointing news just lately in our country. The economy going down, the unemployment rate going up. More days of austerity, its going to get worse before it gets better There's lots of disappointing news!! That's when you feel overwhelmed, when you're stressed out, stretched to the limit, frustrated. You've got too much to do and you don't have enough time, you don't have enough money, you don't have enough energy. My guess is that some of you are in dark days of distress right now. You may be stressed out financially. There's too much of the month left over at the end of the money. Do you ever lose your way? Do you ever feel like you're up in a cloud and your head is in a fog? When you look at your past you get disappointments. When you look at your present, you get stress. When you look at your future, you get doubtful and worried. He will encourage me when I'm disappointed; He will strengthen me when I'm distressed and He will guide me when I'm doubtful. This Christmas, you may feel overwhelmed. Maybe you're going through one of these dark days -- the dark day of disappointment, or distress or doubt The good news is because of Christmas, there is now a light in the world that can drive away that darkness. His name. is Jesus! !